Art is a very big variable of the African experience, it might not be evident to us due to all our art history being stolen by our colonial masters or the terrible state of our society which keeps us all trapped and confined with a way of free our natural senses and elements. Regardless, Art is everything in the African taste. We see the world as a beautiful exploration of colors, shapes, cultures, ideas, the African mind is shaped by its innate sense to create form where there is none. Having a conversation with a Lagosian, you almost want to paint their words into a tale visual for everyone to see. Our characters seems to mimic the story out of a cartoon or comic, we’re brush strokes of beauty and righteousness. Other epochs of humanity have had their drive to be art documented through their eras be it a Renaissance or Baroque, but never from our side even though we’ve incubated these timelines within our cultures. Yet a New Age has emerged that gives these constructs more value as they should have from the very beginning. Street Art by Olatunde Alara. Olatunde Alara is one of the visionaries leading the discussion of Art, its meaning, and how we use it to understand the broken classes of our society. Our age exists in a time where the youths speak out, they want to be more in tune with the narratives that govern their ideologies, with the abstraction of Alara’s art in whatever form he’s using his art to preserve our stories in time. A story that allows room to explore, to live, to be free. Must art be conceptual, abstract or both to be understood ? 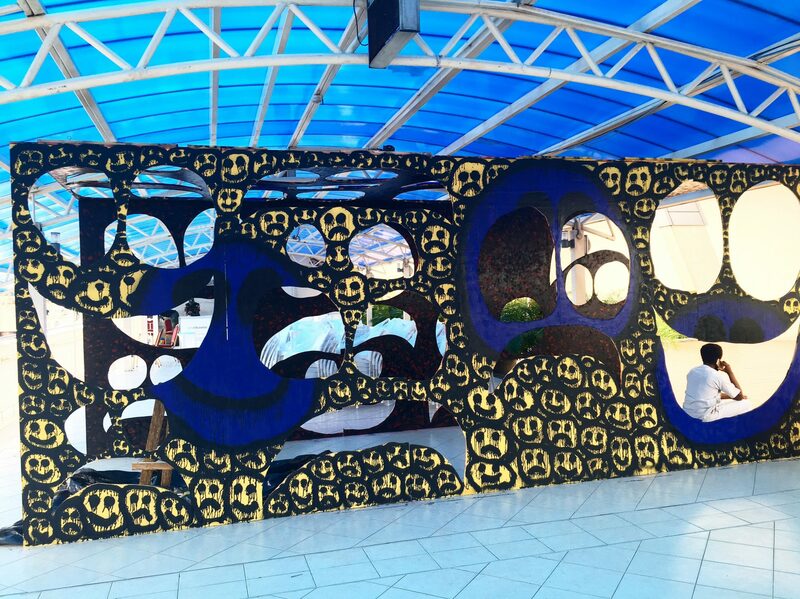 Olatunde Alara : Art can be anything. How it’s interpreted varies according to who is viewing/experiencing the art. I say this cause your art carries so many layers of abstraction yet it’s all directing points of your general views. What is art to you ? OA : Art is a necessity. It’s something that I need to do, it’s an escape from things/emotions that are uncomfortable and hard to confront, It’s a reflex, a need to want to express myself. I don’t know it’s hard to articulate because I feel like art is just is. It’s like asking, ‘Why do you breathe?’. 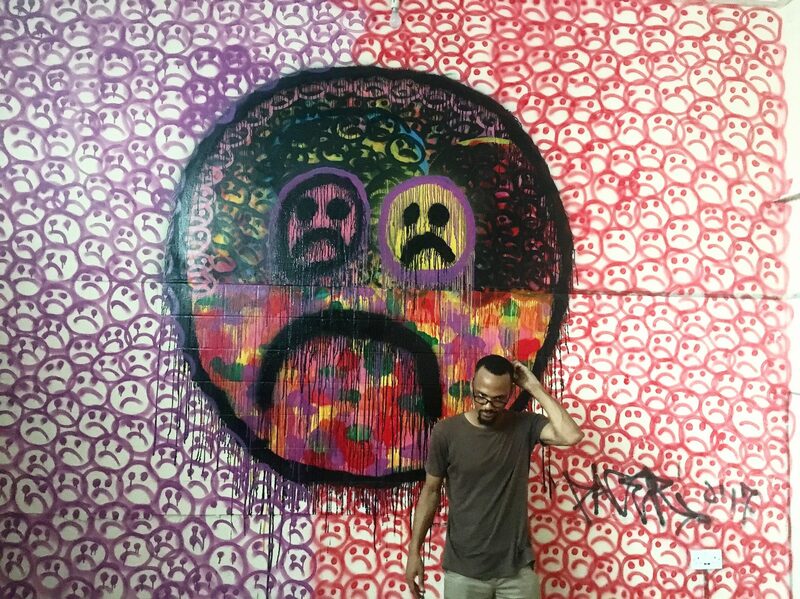 You’ve been spraying around Lagos with your mark, it reminds me of Basquait masking the NY and the walls of MoMA with his SAMO trademark. What’s your direction and inspiration ? OA : Well I spent my formative years in England, specifically London. Growing up there I was surrounded by Graffiti, and as a young impressionable mind, the idea just always seemed right to me. I never got into Graffiti because I wasn’t dedicated and wasn’t that great at it. 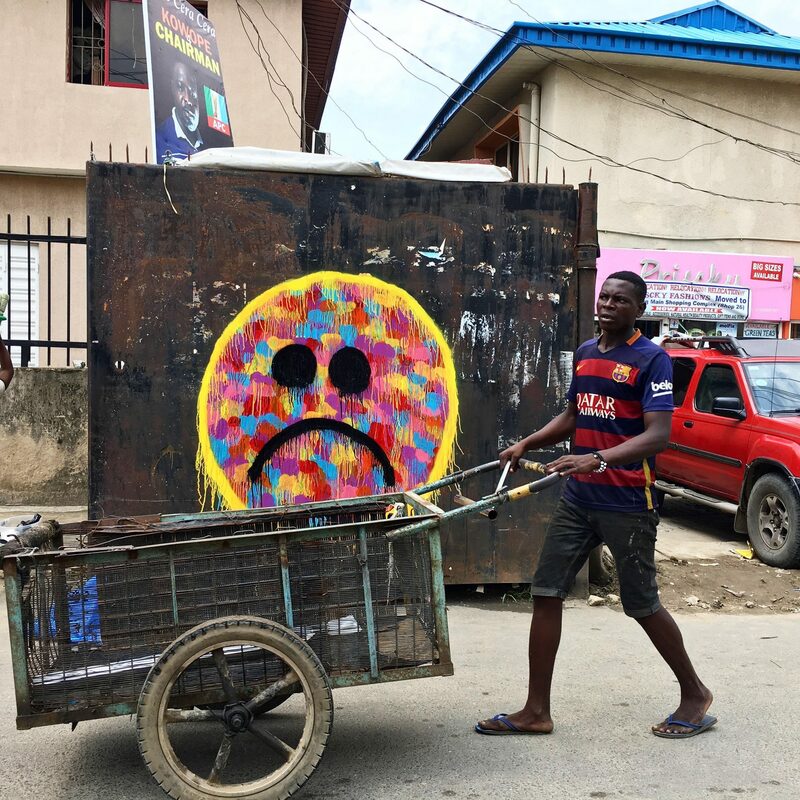 It wasn’t until 2015 when I first started experimenting with spray paint that I got the idea, at the time I had become quite frustrated with the lack of outlets [ In Lagos, Nigeria ] that seemed to be available to freely express themselves. Which is where making art in public came into play, as time went on the reasons evolved to match wherever I was at artistically. 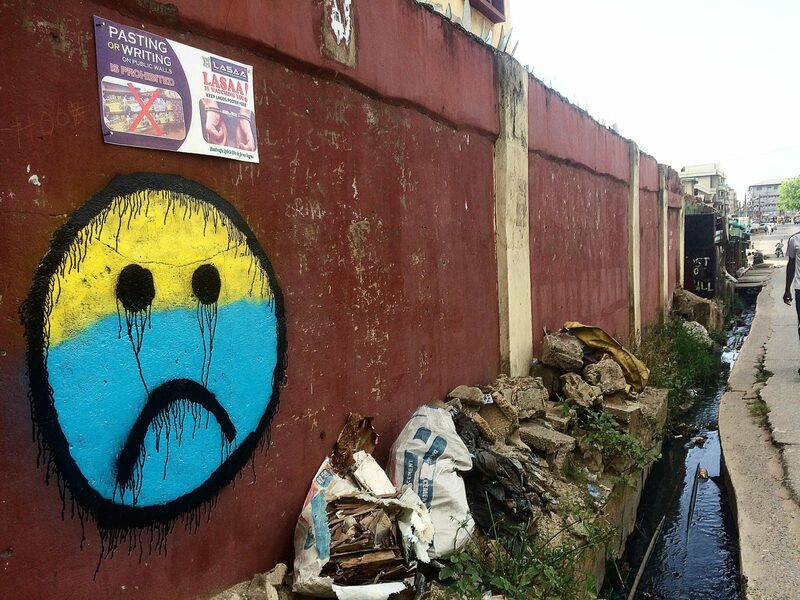 How did Lagos play a role in your graffiti and what story does each mark you lay around tell ? OA : I don’t do Graffiti, which I feel is important to point out. Graffiti is a very specific art form, defined by specific style (writing letters) which inspires what I create in public but ultimately very different, It’s leans more towards street art. Lagos ultimately is very conformist and living here can be oppressive, in the sense that everything is organized into cliques, basically who you know. I’ve never really been into group think, I like the idea of having to define myself according to my own rules which is what creating art in public does for me. I don’t have to be tied down to the social conventions of the art scene in Lagos (which are often times pretentious and elitist) because the same rules don’t apply. What’s unique about your street art ? The influence you bring into it ? How can art break out from the conformist ways to allow more kids involved in growing and creating their essence, views and stories without feeling trapped ? OA : I don’t think there’s anything unique about my street art. I do it because I like the rush, the excitement of breaking rules, the thrill that otherwise non existent with living in Lagos. It’s a stamp, It’s to let people know I was here, that I exist. It’s reclaiming a space that should be ‘public’ but when you factor in the politics that govern such spaces. Members of the public get excluded, I think kids who feel trapped need examples. They need to see someone else living their lives unapologetically, Which is what it ultimately is for me. You talk about spaces a lot, how important are they in growing and nursing the art scene to create a conducive enough experience and environment ? OA : I think for every artist having a conducive space is necessary. I mean if your job is to create, then you need a space that encourages it. Lagos isn’t always the easiest place to create from, considering all the barriers both social and economic that comes with it. So expanding that is necessary if anything important from the arts here in Nigeria is to develop. How do you feel about the current spaces emerging to fill this void ? Are they doing enough ? OA : I don’t know. I don’t enough about these other spaces to give an opinion. I do think that it’s a bigger problem than what DIY spaces or individuals are doing. Of course not to say you can’t hold people/spaces that are suppose to help fill the void that currently exist, It’s just more of a thing where for the longest time, art has been appropriated to serve the rich (aka gatekeepers) and undoing decades of what we currently have is going to take time. What’s rich about African art to you as one pushing the narrative forward ? I’ll say African art is the abstraction of our stories being told and crafted in ways relatable and inspired from the African narrative. art defining what it means to be African with nuance. Because the definition is layered, From themes to approach or even medium. Let’s talk about your art more, how does the style you use match with the essence or message behind the art being created ? OA : I think I had a style even before I realized what it was. When I studied art in school, the emphasis was not so much about always drawing something beautiful, it was always about expression. So for example we studied two British artist called, Gilbert and George who created very provocative works and it didn’t matter if it was obscene it was about like how it made you feel. My art usually as a very off kilter edge about it, like that feeling you get when you sense that something is ‘off’. I feel like there’s something about experiencing art with a feeling of uncertainty. These days I see too many art created and presented in a way that is just too certain, which is another word for predictable. My art isn’t really about that, I like to challenge how far I can truly push my ideas. You talk about the elite part of art in Lagos, the kids at trying to break that margin. Do you feel your presence at ArtX last year helped open up the audience more to new minds and ideas ? OA : I hope so. There aren’t that many outlets for unapologetic self expressions within the visual arts scene in Lagos, so I hope that My installation at Artx opened people to something that I consider a serious subject that isn’t depicted enough and when it is, it usually lacks depth and comes off as corny, which is mental health. So depression, anxiety, trauma, these are very real issues that affects myself and many others, so I hope people could relate to it. Tunde Alara showcase at ArtX. Africans have a system of not appreciating art and the beauty around us. What can we do to change this ? OA : I don’t know if I necessarily agree, even though I think it’s a statement founded in some truth, I think it’s all about context. Nigerian/African history is very rich and robust, and in fact I do think that people are interested in art. I think that because most people are surviving in this part of the world, they might not necessarily have time to appreciate art. Plus mainstream art circles mostly cater to the taste of the rich so if poor people can’t relate it might not be that they don’t appreciate art. It just means that it’s not their cup of tea, Also I don’t have the answers, my work hopefully in the future, as it evolves can shed more light. Is the art created from the other side of Nigeria’s economy different and more elegant than ‘rich art’ ? It’s all art but is there a variation that makes it mean something different in its different social classes ? OA : I don’t know, what is ‘rich/poor’ art. It’s too definitive, I usually avoid positions like that. I can speak for myself though, my frame of work tries to centre my experiences navigating living in Lagos, based within a framework that engages working class experiences on the premise that arts and culture don’t always have to centre the gaze of the rich. So the motivation is different, the end goal isn’t just money, even though that is an important aspect if that’s what you’re into the arts for. How much does the background of an individual play in his access to art, I mean the kids all tell different stories but aren’t heard. OA : I feel like people who grew up around economic/social privileges have more access to art, but I don’t think that inherently means they are more creative/cultured than working class artist for example. All it means is that those with access have more advantages, but that doesn’t necessarily mean anything in terms of the standard of what is being created. Half of the rich ‘cool’ kids running around aren’t really producing anything that I consider inspiring, even though they are more visible. The art scene really exploded in the last few years, we have a New Age of art reshaping the scene. What do you think about it going forward ? OA : There are two ways it could go: the first being, a continuation of the Renaissance that is currently happening, with more emerging voices with an unapologetic approach to art stepping into the scene to make an impact. The second thing is, that the art scene might not live to its potential and we might just be stuck with what we currently have now; which is a redundant and lackluster scene more interested in noise than actual impact. I guess the future will tell. What role would you like your art to play in the New Age of Africa ? OA : I hope it gives opportunity to more voices, who equally feel as out of place within contemporary Lagos society, and hopefully beyond.